I could talk about all the paintings and artworks I saw there, but that’s too easy. Instead I’ll talk about the building itself. Built in the 1880s and heavily renovated a few years ago, it’s not your typical art museum. Sure, there’s the maze of rooms and galleries showing off their impressive collection, but no other museum I know of (or have been to) has anything comparable to their “Gallery of Honor”. On the second level, this core of the museum is more like a cathedral than a gallery. You enter it through the Great Hall (which was the original entrance to the museum), which features huge stained glass windows in a Gothic style. The main windows depict Dutch artists, musicians, and cratfsmen as if they were saints. Smaller windows depict various artists at work. See http://www.victorianweb.org/art/architecture/cuypers/1.html for more information on the building and the windows. In the Gallery itself, the ceiling is high and arched, with supporting columns (probably just decorative). 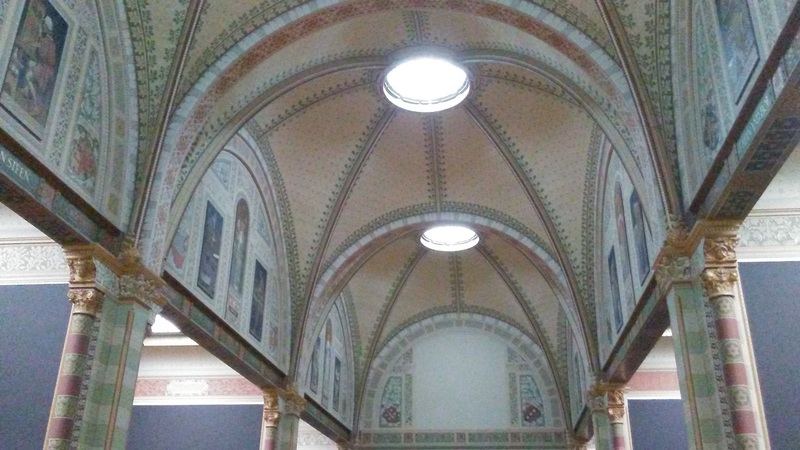 Look up, and you’ll see frescoes of the great artists of the Dutch Golden Age. While “lesser” artists occupy the side altars, the main altar at the far end is a separate room for Rembrandt’s “Night Watch”. The whole effect is quite different from most art museums in that the focus is made to be more on the actual artists than their works. It’s also worth remembering that photos of artworks don’t really do them justice. It’s not just the difference between a reproduction and the original, but that photos in books cannot give you a sense of the *size* of the original. One could, technically, stick a Vermeer in a photocopier (NOT recommended!) and get a nice, actual size copy to hang on your living room wall. An actual size copy of “Night Watch” would BE your living room wall! I note that the “Cathedral of the Arts” motif continues on the exterior of the building. There are frieze-like panels showing artists and scenes from Dutch history. There’s also some nice gardens, with occasional sculpture, where one can relax without apparently having to pay the museum’s entrance fee. Across the street from the Rijksmuseum – well, across the street on the side – are two of what I would like to call “corporate museums”. These are little museums operated by old and respected corporations, where they show off their history and what they do as they guide you ever so gently towards the sales room. One of them is the Diamond Museum, operated by Royal Coster Diamonds. Amsterdam has long been a center of the diamond trade, and is still home to a couple of firms. The museum has a decent display on how diamonds have been turned from rough crystals into objects of desire. There are displays featuring some antique cutting, polishing, and grading equipment. No actual diamonds, though. I’m thinking it might be interesting to have a “Can you grade this diamond?” interactive display, where you can rotate the *images* of cut and polished diamonds to look for inclusions and other imperfections. But what do I know. Anyway, it turns out that the Coster Diamonds “store” is in a separate building. If you happen to have many hundred Euros burning a hole in your pocket, you might be interested in making a purchase – it’s a regular high-end jewelry store. I felt really out of place there. A better, or at least more entertaining, corporate museum is the “Bols Experience” at the House of Bols. Lucas Bols started making his eponymous booze back in the 16th century, so there’s a lot of corporate history to cover – which they quite happily downplay (the antique bottles were cool, though). The “experience” is more about showing all the flavor and aromatic components that go in to liqueurs. It’s a very “hands-on” display. You can stick your hand into a bin of dried orange peel, and puff some aromatics into your nose in a sort of “What’s That Smell?” quiz. Probably the best part is at the end, just before they release you into the company store. These days, Bols is sponsoring bartending workshops (featuring their vast collection of liqueurs, of course) all over the world. 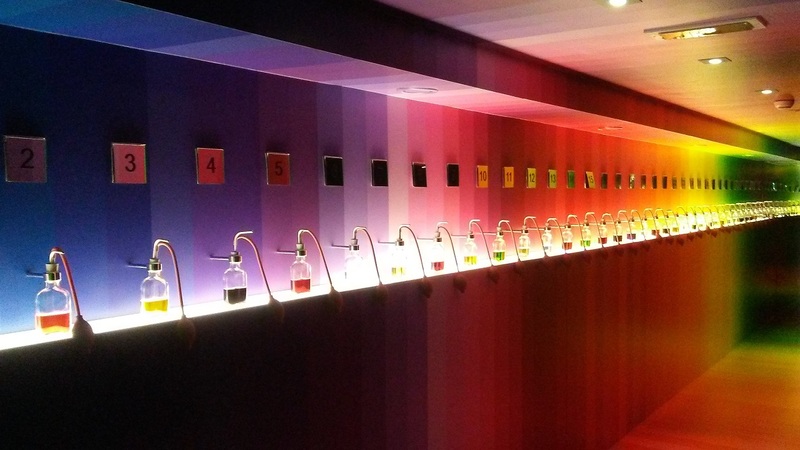 So it makes perfect sense for the end of the Experience to be a bar, where you get to have a cocktail showing off the possibilities of Bols liqueurs. Or, if you want, you can even make one yourself under the watchful eye of a corporate-trained bartender! Combine all ingredients, and shake over ice. Strain into a champagne flute, and top with prosecco. Garnish with a twist of lemon peel. It’s a light, floral drink that put me in mind of a warm and sunny Saturday morning in May. Now I just know that there’s one neighborhood in Amsterdam that you’re all waiting for me to talk about, right? Can you wait for the next post?